To make sure you get the best deal we'll show you great prices from all of our drivers, including L.J Merton & Surrey, if they're available on the day of your move. Have a question for L.J Merton & Surrey? No problem, send them a message and they'll email you back as soon as possible. If you have a more general question you might find it answered in the FAQ, or you always contact one of our brilliant customer service team. * L.J Merton & Surrey won't be able to see your email address. We are an experienced removal company you can rely on. We take good care of every customer's belongings. We have a nice and tidy van which always comes fully equipped with blankets and straps to secure your load. Our staff are very fit, and able to lift heavy items. We work hard to get the job done properly. We know that moving can be stressful, but don't worry; we're here for you. Let us do the work and make it look easy. Customers are able to travel in the van free of charge as a courtesy from the driver. In no way does travelling in the van constitute a private hire and the cab of the van does not constitute a public area. Therefore please be aware that no smoking rules do not apply. Nice guys. Bang on time. Helpful, polite, efficient and took great care of all the items. What more can you ask? Thanks. "Just wanted to say that I’m really disappointed with this situation and the customer as she never said anything on the day also gave us a small tip that would suggest she was really happy with us as well. There have never been a situation that we haven’t been respectful for a customer or she’s belongings we always take care of it as it’s big part of the job we’re experienced guys that are in removal business for years but most important we’re professionals. There was no issues between us and the customer on the day as well. In 2,5 hours we done 2 full trips for a customer even though we had a bit of a long walk also we took all the garden stuff like garden furniture pots and on day before that job there has been severe weather so all the stuff was dirty and muddy but it was no problem for us even though we had a next job after and it was house move so we had to do quick cleaning of the inside of the van. Communication wasn’t the best as well as customer didn’t speak english too well but that wasn’t a problem we sorted the job the best we could. We’re really disappointed after getting this review." Great service, perfect time, everything was really easy and smooth. This Is a review for the replacement van that arrived as the original booking was not honoured and the original driver NEVER showed up for the removal. We are sorry that the original driver fell ill, however, your booking was honoured and completed in full by the replacement service. 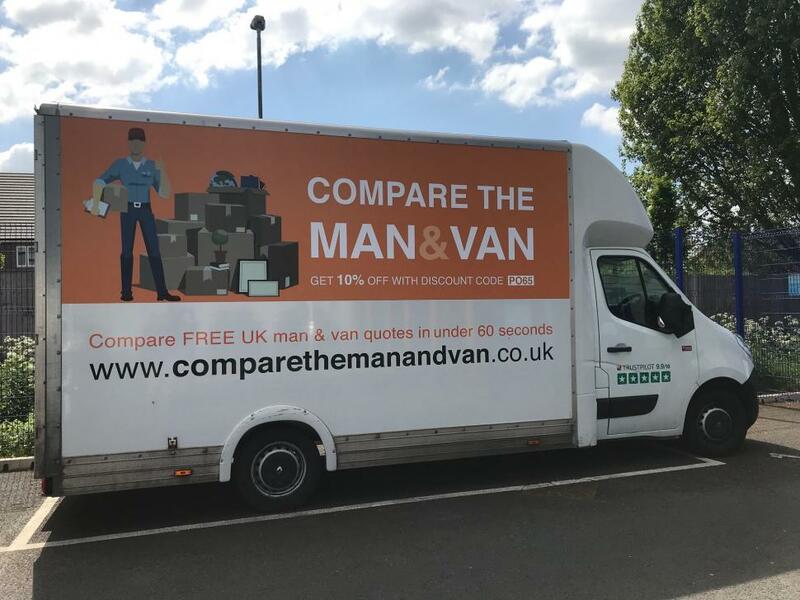 Very happy with the service level from Man and Van. I hired for two movers for better efficiency. My move was from Elephant and Castle to Canada Water, a mere 15 minute drive. I booked them for 2 hours with everything packed and ready to go. I even provided a trolley for them. They took over 3 hours and charged me an extra 55 pounds. The service was very dissatisfactory as they were so so slow with the moving and inefficient, i.e. one would carry the trolley with 2/3 boxes (it has the capacity for 4/5 boxes) and the other would carry a bag or two, which are not heavy at all. It was clear that they wanted to prolong the time so they could charge me more with overtime. It isn't fair and I wish to have the 55 pounds back as in the end, they left with over 10 large boxes by the corridor of the second home, which I had to carry back to the flat. Very friendly and helpful professional service. Would recommend and definitely use again.. thanks. The website was easy to use. The driver's arrived on time for the collection and the delivery was on time too. Very respectful guys who did the move on one of the hottest days of the year and really took care of the stuff. However, our only complain is re the timing as they did 7.5 hrs vs 4 hr booking. We felt they could have done the job quicker. They were nice and didn't break any of my items, but did charge me more at the booking. We were 65 minutes over, so I was charged for 90 minutes of time, which I feel they could have spared the 5 minutes. They also charge me more for having 3 flights of stairs, even though I am on the second floor. As they consider the group of stairs, not the length of those stairs to be a flight. Obviously, I feel this was ridiculous but you can't say no to paying them when they have all your stuff in their van. CMV RESPONSE: A flight of stairs is 8-12 consecutive steps. We do ask customers to select how many flights of stairs will need to be ascended, rather than how many floors. I would definitely recommend these guys. They were efficient, helpful and friendly. Thanks guys ! Hi, Having read through the review, I submitted earlier, I made a typo, where I said I was not disappointed. I am extremely disappointed and unhappy with the service we received. In addition, I would like to also point out, despite agreeing to move the time from 12 to 11, because I missed their calls on Saturday, they blamed us for ruining their timings. I should note that I booked the man and the van 3 weeks in advance. They should not be blaming me for their schedule not flowing as they wish it to. Great team. Would def use them again. They arrived 2 hours 20 mins late but once here, they were great. Even though the driver was late, he notified me of his late arrival in advance. The movers took more than 5 hours (not counting driving between properties) to move a typical one bedroom flat. Of course that cost me a fortune in extra time. I don’t think I’d use them again. My name is Lucas from L&J Removals and would like to say that we feel that this review is totally undeserved. On the job the customer didn't say anything to us and was happy and thankful for the job we did, yet today we noticed she left this review. On that job we had a very long walk from the van to the property at the first address, as well as at the second address we had to walk about 70 meters with the goods from the lift to the van. The van was parked on a main road as the customer had not arranged suitable parking, and eventually we had to park at the back of the building whereas the flat was at the front. This meant that we had to go across the whole building to get to the van with the goods. This obviously took considerable time although we used trolleys for all the goods. The same situation was at the second address. It was about a 40 metre long walk and there was trouble with the lift as there were of course other residents who used it, so it was time consuming as well. It would have been more cost effective for the customer to pay the stair charge so we would not have been limited to using the lift. About the lateness we let the customer know that we are going to be later a bit as we were coming back from different job and customer sad that it's fine and told us to take our time. Our van is always equipped with straps blankets and trolleys so we don't agree with what customer put in the review as well. Great guys! they arrived on time and were very professional. I highly recommend them. Our driver and helper were nice and good with our belongings but they didn’t come with trolleys which would have made things a lot quicker. We ended up having to pay another £60 for going overtime which I think some of that could have been prevented with trolleys. We also had to pay a £65 parking fine so the whole thing ended up rather expensive. It's wasnt on time but I was informed at all times. Everything else went very smoothly and would highly recommend using them again. The guys were both an absolute delight to deal with: professional, efficient, courteous, accommodating, polite, nothing was too much hassle for them. They made what was a stressful event bearable with their 'can-do' attitude, they were lovely and considerate of my two small children and overall, the experience was a very positive one and truly exceeded our expectations. Highly recommended! These Jack and Lucas are great and made moving so much easier than it would’ve been otherwise. Definitely recommend them! Very efficient & courteous ,managed to move furniture from/to very awkward places. Absolutely brilliant movers. Friendly and courteous. Treated everything with respect. Managed to finish the job with plenty of time. If I could give more than five stars I would. Lovely guys, moved everything with no issues. Will definitely use again! Extremely pleased with the excellent service we received. The driver was extremely helpful and co-operative, he definitely went 'above and beyond'. Only 20 minutes late - due to traffic - he called to let us know he was on his way and gave an indication of how long it would take him. Excellent driver and man. Did everything from loading to unloading on both sides. Very happy and helpful. Will use again for house clearance and move. Really great guys. Polite, friendly & did a fantastic job moving really heavy items. On a long two trip move. Excellent service , kind and caring. Lucas and Jacks were very professional and personable . Rang to tell me he was stuck in traffic. Not a problem for me though. Great people!! Extremely helpful!thank you so much!